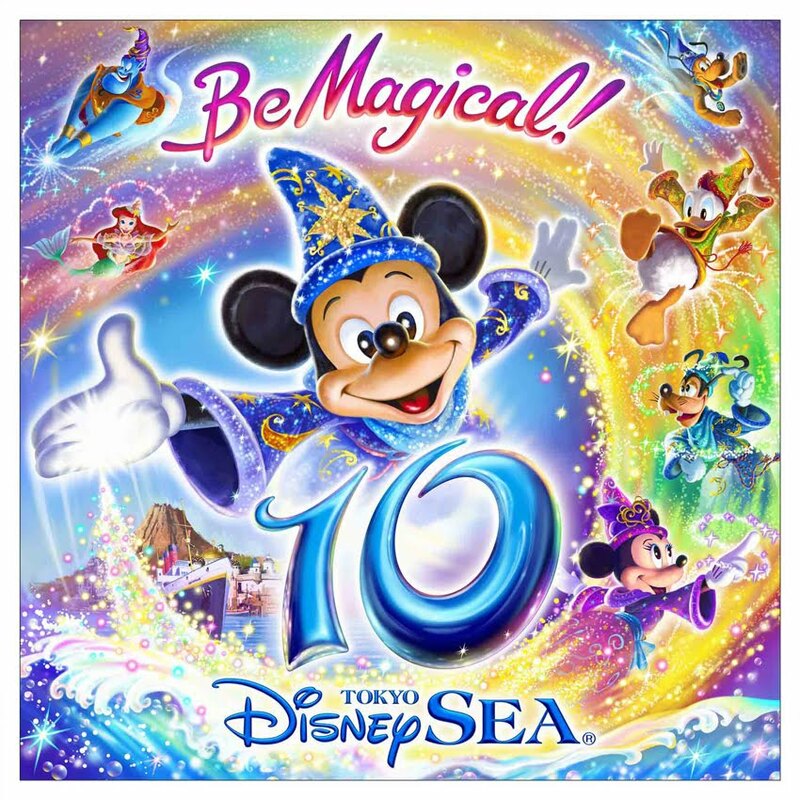 URAYASU, CHIBA—Tokyo DisneySea® Park is holding the “Be Magical!” special event to celebrate the Park’s 10th anniversary. Tokyo DisneySea, which had its grand opening on September 4, 2001, will celebrate this milestone anniversary for almost a whole year from April 23, 2011 through March 19, 2012, divided into five different periods. Mickey Mouse will cast his magic over Tokyo DisneySea, with Disney favorites like Minnie Mouse, Donald Duck, Goofy and Pluto joining in the fun all dressed as sorcerers. Among the many magical programs to be offered are the new nighttime spectacular, “Fantasmic!” featuring Mickey as the Sorcerer’s Apprentice; and the new attraction, Jasmine’s Flying Carpets. The celebrations will kick off with the new nighttime spectacular, “Fantasmic!” Mickey Mouse as the Sorcerer’s Apprentice will create a world of fantasy and imagination on the waters of Mediterranean Harbor every night. The days will also be filled with magic, including character greetings in Mediterranean Harbor featuring the Disney friends dressed in their 10th anniversary costumes, and other special programs. Summer will see the launch of the new attraction, Jasmine’s Flying Carpets. Guests will be able to take a ride on these magical carpets and fly above Arabian Coast. Including the opening programs, the celebrations will take place over five different periods, with cooling programs in summer, Halloween events in autumn, Christmas celebrations in winter, and the New Year bringing special programs for a grand finale. Throughout the Tokyo DisneySea 10th anniversary year, guests will fall under Mickey’s magical spell, and experience a world of Disney dreams and fantasy as never before. The 10th anniversary year is certain to “Be Magical!” at Tokyo DisneySea! Our next meet is scheduled for Friday, Jan. 21 . The meet is from 7 til 11pm. Thanks to Kyle Duffield for turning me on to this App. It’s seems better than u-stream you can sign up through your twitter or FB accts. It includes LIVE interactive chat, questions, and multiple hosts. I will be posting the date and time of our first video chat shortly….. Subscribe to “Celebrations” Magazine and read my latest contribution….. The basic metal used in making true cloisonné pins is copper. It comes in long strips, which are cut into pieces to match the length of the desired pin. A die cut is prepared of the pin details, and using a die press machine, the outlines of the pin are pressed onto the metal strip. Excess copper is trimmed away to give the pin its size. Each copper design is passed into an open flame heat treatment to remove any foreign particles. An acid treatment comes next to clean off stains. The number of such treatments depends on the complexity of the design; e.g., the more colors there are, the more acid treatments are required. Generally, enamel is used for coloring. It comes in powder form and is mixed with water. The enamel is added to the pin by using a needle for small areas and a brush for larger areas. The heat treatment allows the enamel to adhere to the copper. One color is applied at a time, followed by a heat treatment. Extra colors and detail prolong the process. After coloring, a sharpening stone or electric grinder is used to sand the enamel surface to remove the excess. Sanding will bring out the details. Following any touch-up of imperfections, another heat treatment is required. Various grinding polishers are used to polish the surface. Fasteners are soldered to the back. A “gold bath” is given to each pin to provide for the gold plating of the copper parts. The true artistic talents of the maker are exhibited in the final step of smoothing the pin, a very detailed process. Each pin is sanded to bring out the fine lines of the design. If too much pressure is used in the sanding machine, the surface will be ruined; if just the right amount of pressure is used, a high quality product results. Just a quick note to let you know our first meet of 2011 and the beginning of our 9th year anniversary is taking place Saturday, January 8 from 1til5pm. Hope you all can join us at some point this year stay tuned for lots of exciting projects coming in 2011!!! I just want to take this opportunity to wish ALL my friends the Happiest of New Years and I look forward to bringing you many exciting projects in 2011!!! You are currently browsing the The Central Jersey Disney Pin Traders blog archives for January, 2011.